Joe started his career on Wall Street as an oil trader on the New York Mercantile Exchange. He saved every penny he could and in 1995 Joe bought his first piece of land in Brookville, New York, where he developed and sold his first spec home. In 1996, Joe merged his Wall Street expertise, business acumen, and passion for construction by creating Farrell Building Co. in the Hamptons, and has since created the fastest growing building company on the East End. For over 25 years, Joe has remained as involved as he was on the very first day. From his unique and innate ability to envision space to the amazing Farrell team he has assembled, Joe oversees every house built by his company. Butch is a lifetime resident of Montauk, New York and enjoys the East End with his wife and two children. A natural outdoorsmen with a keen eye for construction and the art of site development, Butch graduated high school and immediately immersed himself in the building industry. Excavation and site preparation became his expertise and he is well known as the best in the business in local circles. In 2000, Butch started Butch Payne Excavation. Butch Payne and Joe Farrell met in 1998 on a Farrell Building Co. job site. A natural alliance in business and friendship was formed and the Farrell team and family philosophy was strengthened. Butch managed his own company and has served as the site expert for every Farrell job since 1998. 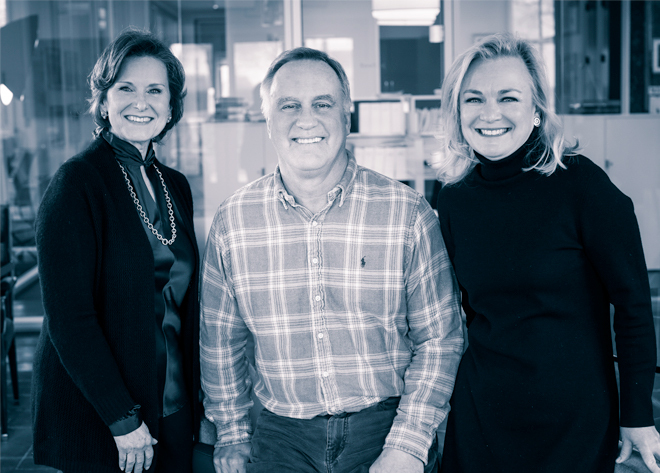 In 2014 Butch officially joined the Farrell Building Co. team full-time as Vice President of Operations. To date, Butch has worked on over 425 Farrell homes, creating a team like no other. Kyle, a New York native, grew up helping his father with small renovations on their family home. He had a knack for choosing the hardest summer jobs with the longest hours: residential construction, dock and pier building, working on boats, all of which solidified his strong work ethic and love of construction and development. After graduating from SUNY Farmingdale, the owner of the Weichert Realtors in Commack overheard Kyle speaking and insisted that Kyle work for him as an Associate Broker. In this role, Kyle was named the Fortune 500 Relocation Specialist and earned the award of Top Producer for his branch. Kyle soon realized he loved helping people find their dream home. In 2007, Kyle saw a natural fit as he was able to pursue his passion of building and development as the Assistant to the Vice President at Farrell Building Co., where he quickly earned the title of Operations Manager. Kyle now resides in The Hamptons and spends his spare time keeping active by boating, skiing and spending time with friends and family.